In truth, this is the first drawing I made for this book, but as it more clearly indicates the nature of the first chapter I thought it prudent to release after. The sky gave me some trouble because at first, my research indicated that my Martian sunset should be in hues of lime green and turquoise but after a conversation with another sci-fi writer, Allen Shoff, I was assured that once my Martian planet had a relatively-self-sustaining atmosphere the sky would take on a more familiar hue. The dust storm on the left also gave me trouble and I don’t think I’ll ever be quite happy with it. Perhaps I should travel to a desert location and experience one in person before I could ever be completely satisfied with it. The trees are deliberately inaccurate. My story opens in Autumn so the whole world is cast in golds and oranges. Symbolically such a choice made sense to me for the story but in visual art, it did not offer enough contrast. 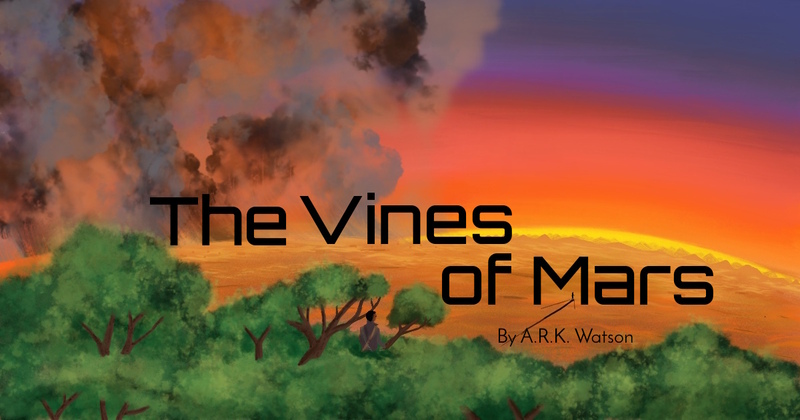 The title is a joke on an oft-quoted adage from writing classes; “There are only two types of stories, A Person Goes on a Journey, and A Stranger Walks Into Town.” The Vines of Mars definitely falls into the latter category, though I hope it may be as original in the telling as it is typical of a beginning.